Please select a size. UK 3 - In StockUK 4 - In StockUK 5 - In StockUK 6 - In StockUK 6.5 - In StockUK 7 - In StockUK 8 - In Stock Please select a size. 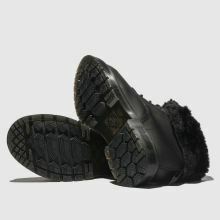 Keeping your toes cosy all day long, Dr. Martens deliver the super-furry 1460 Kolbert Snowplow winter boot. Fit for the feet of any fashionista, the black leather upper creates a premium vibe while a fluffy lining makes for an ultra-toasty finish.